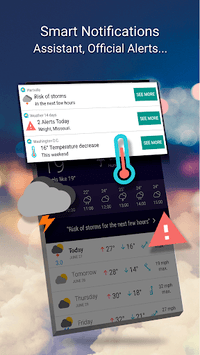 Trusted by millions of Android users around the world and hailed by meteorology fans, Weather 14 Days is the official free App from TheWeather.com (Meteored). Featuring its own forecasts produced using the best prediction model in the world. 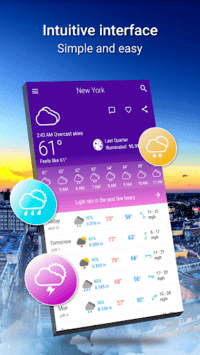 You can enjoy a modern and original layout based around Google's Material Design to access detailed and highly accurate local weather data quicker and easier than ever before. With over 15 years of forecasting experience, we won't let the weather surprise you. Unlock new Color Themes by completing our in app Achievements designed to help you make the most of the app by discovering all the available features. Remember, the application automatically changes color when the temperature changes! Receive official weather alerts for your area from the National Weather Service, including warnings about storms, strong winds and other adverse weather events forecast for the next few hours. In addition, our optimal app Assistant can notify you about important weather changes in the coming days. Now available! A new animated world forecast map based on the ECMWF showing the weather forecast for the coming days. Access animated weather radar of the last few hours provided by the NWS along with visible, infrared and water vapor satellite images provided by NOAA. Check the current conditions along with the forecast for the next 14 days with a simple slide of your finger. Select a day to view detailed hourly information including temperature, precipitation, wind speed and direction, wind chill, pressure, cloudiness, humidity, sunset and sunrise times and even the phase of the moon. Don't forget to try turning your device sideways to see how the weather will evolve throughout the day with our amazing graphics. After installing the App you can customize your desktop with the most modern widgets currently available. 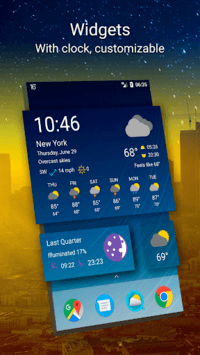 You will have access to up to 8 widgets with different sizes and weather data. Share weather forecasts with your friends and family anytime you want with whatever device or social network you like to use such as: WhatsApp, Twitter or Facebook. Find the forecast most relevant to your exact current position or search for your favorite locations from over 500,000 all around the world. Available in over 50 countries and 20 languages. - New Marine Weather Maps. - Spread the Weather 14 days. - Discover another way to check the weather. - Forecast based on ECMWF. ©Meteored.